Buy Biona Organic Spelt Pasta Wholegrain Penne - 500g in the UK from our online shop or directly from our independent Scottish store. Sunflower seeds are a good source of vitamin B6 and zinc which can both help with healthy skin and nails. Sesame seeds are surprisingly high in calcium, so ideal for people on a dairy free diet. And of course the vegetables are high in vitamin C and fibre to help maintain a strong immune system and aid good digestion. This recipe contains 300g spelt pasta (fusilli or penne). This recipe reminds me of my student days, when money was tight and cooking wasn’t high on my list of priorities. But with this dish you are getting all the 5 major food groups: carbohydrates from the pasta, vitamins from the vegetables, oil from the olive oil, protein and a dairy-alternative from the cream cheese. On top of that, it’s low in saturated fats and the olive oil helps maintain healthy cholesterol levels too. Delicious and nutritious! This recipe contains 300g spelt pasta (fusilli or penne). Where can you buy real Spelt Penne safely online? If you are wondering where you can buy Biona Organic Spelt Pasta Wholegrain Penne - 500g safely online in the UK, then shop with us. 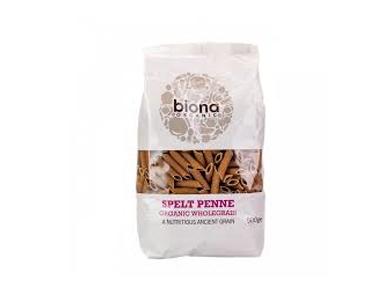 Spelt Penne - Biona Organic Spelt Pasta Wholegrain Penne - 500g in Spelt & Wheat Pasta and Dried Pasta.